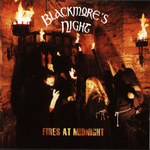 Subject - Blackmore’s Night Fires At Midnight – A 2001 recording, released on Steamhammer Us/SPV records, with cover photography by George Chin. One of rock music’s Renaissance men, guitarist Richie Blackmore is the one who has taken the term most literally, having played for the past 10 years in Blackmore’s Night, a band that brings his amazing talents and prog-rock sensibilities to a mix of music that includes Renaissance-era melodies, English folk and recreations of more current folk/rock tunes. Joined in this effort by Long Island’s own Candice Night on vocals and a backing band of squires, lords and bards playing a broad range of medieval and modern instruments, the band has released a series of well-received records and toured regularly, appearing at Renaissance-themed fairs, festivals and unique concert events in castles all over the world, charming audiences wherever they appear. While Deep Purple and Rainbow fans might at first question why one of hard rock’s most-influential guitarists is focused more on complex romantic song structures and subtle nuance rather than the gutsy, bluesy power playing that endeared him to rock fans (and legions of admiring fellow guitarists) in the 70s and 80s, it is clear that this is the music that he holds most dear. One listen to Fires At Midnight will entrance listeners with a mix that successfully highlight his electric guitar leads within the structures of beautifully-sung and played melodies and rhythms. "One of my clients - the Japanese music magazine Burrn! – had commissioned me to go to Germany to photograph Blackmore's Night for a cover feature in the Bavaria region in Germany at a small castle called Schloss Eggersberg that was located in a small village in the middle of a national park on the banks of the Danube at least two hours drive away from Munich, the nearest major city. It was an amazing place, with forests everywhere. Prior to this I had photographed Ritchie in concert with Deep Purple, but never with that band in a formal session (this somehow never came together), and so this was my first time to meet the great guitar legend. I spent three days in Germany with Ritchie and Candice (Night – lead vocalist and multi-instrumentalist) and Carole, who is Candice's mother and the manager of Blackmore's Night. After dinner on the second night, Ritchie explained that the name for the album would be Fires At Midnight and he wanted to shoot the cover of the album at Schloss Eggersberg at midnight (of course!) with the castle as a backdrop, and a series of bonfires lit around the castle. As we talked about it, it became apparent that it would involve additional lighting to illuminate the castle because it was pitch black at midnight, with no other lighting available apart from moonlight. At this time, Ritchie never officially asked me to do the cover shoot - he only asked me what I thought of his concept as a photographer and whether the idea he had would work on film. I provided some input and suggestions, but it was left at that and I returned to London after listening to some of his ghost stories on the last night after dinner (more on this later). One Friday morning, about two weeks later, I got a call from the record company, SPV in Germany, asking me if I would be available on Sunday to fly to Newcastle, in the north of England to shoot the cover for the forthcoming Blackmore's Night album - Fires At Midnight. Ritchie and Candice would be doing a private concert for their fan club in the rand hall of a medieval castle – called Lumley Castle - and everybody attending would be in medieval dress. I told them that if the idea was to shoot the concept I had discussed previously with Ritchie in Germany, I would need a lot of lighting. The label said that the lighting that would be available which was whatever was being brought in for the concert - anything else, I had to bring with me on two day's notice! There was no art director involved in this project – we were simply going to base the effort on the conversations I had with Ritchie in Germany. And while I had not spoken to Ritchie any further up until this point, I felt that – as if by mental telepathy - I knew what he was thinking about and I could visualize the whole thing. I really wondered what the record company was thinking at that point – that is, that the whole album - artwork, promotion campaign, etc. – would be resting on a conversation between Ritchie and me. I had never worked with SPV before this and they had to trust their artist and go with his recommendations. This was the first Blackmore's Night album for them, so it was a major act of faith on their part. It was Ritchie's decision entirely to use me for the cover shoot. When I arrived at Lumley Castle on Sunday morning, I hooked up with the label representative, who was still very much in the dark what the shoot was going to be about. I told her what Ritchie and I had talked about and she seemed relaxed and reassured that I had a hang on the whole concept and knew what I had to do. The concert was happening that evening so I figured out that we would be shooting after the concert - at midnight! After lunch, we all sat down and talked again about the shoot. The main concept of fires and flames was still there, but Ritchie was now thinking some of the fans dressed in medieval garb should be holding flaming torches in a recreation of a medieval scene with Ritchie and Candice both dressed in medieval clothes. This was to be photographed at midnight after the concert was over. I had already done a recon of the castle and found that the entrance to the main keep had an old wooden door with an iron grill, whereas the walls surrounding the doorway already had medieval torch holders in place which we could light and use that whole area as the background for the shoot. The lit torch holders would be ideal for flames and I could use the concert lighting to fill in and light the castle walls and also to light Ritchie and Candice. If I shot everything on daylight film, it would have a warm cast overall which would give it a feel of a scene from another time in history. One or two of the fans could be in the shot holding additional torches for added effect. I had brought a smoke machine with me to create some smoky haze and, adding that, this was the entire set-up. Ritchie and Candice loved my suggestions. They also wanted to shoot a drunken medieval scene with the fans in the grand hall after the concert. This idea was a medieval banquet with all the fans dressed up drinking and laying about looking pissed, with Ritchie and Candice at the center of it all as the Lord and Lady of the castle. . I decided to shoot this using the same concert lighting again to create the same old-world effect. I had brought strobes with me, but decided not to use them, opting for the concert lighting instead. By 4am the next morning - after a long night - it was all wrapped up and in the can. Tech notes - Everything was shot as it was set up using transparency medium-format film. I could have done with a couple of extra lighting heads, but had to make do with what was available by pushing the film. I used daylight 400ASA film pushed one stop to 800ASA. I also shot some 35mm on tungsten film to see how that turned out. Nothing was done in Photoshop afterwards - the images were used as they were shot. Everyone was absolutely delighted with the results. The photos were exactly what they had in mind. They chose one shot for the cover and that was it. I had that scanned and sent over to SPV in Germany. Two days later, SPV called me and bought out all the rights to the entire shoot and I sent them all the selections that Ritchie and Candice had made. The banquet scene photo was then used on the cover of the first single off the album ('Home Again' - see image, below) and other images were used on merchandising and websites, including Blackmore's Night official website. The whole project and process worked as if by magic, which reminded me of something that had happened on the last night of my stay at the Schloss Eggersberg. As we were all sitting round the dinner table chatting and having a few drinks, Ritchie asked the lady from the Japanese label to think of someone she knows - a relative, friend or colleague - write his/her name down on a piece of paper, then fold it up and place it under a glass. He then proceeded to 'read her mind' by asking a series of questions – 'is the person male? ', 'does he/she have blond hair', 'is he/she a close relative', etc. - and to each question, her response was – 'yes, that’s correct'. He then named the person - a Japanese name no-one else would have guessed or known apart from the label person herself. She confirmed he was right again and then he asked me to open the folded piece of paper. On it was the name of the person he had just called out. I couldn't figure out how he could have done that because it was impossible to guess the name of anyone, let alone a foreign name. And how could he have guessed that the person had blond hair when Japanese people all have naturally black hair? Now, that was magical!!" 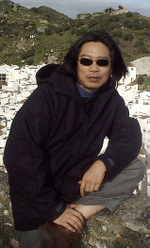 George Chin started his photographic career while still at college in 1979. Gaining access to black artists at that time was relatively easy because, unlike today - apart from Bob Marley - they had little media value. George began honing his photographic skills on artists such as The Jackson Five, Parliament & Funkadelic, Jimmy Cliff, Peter Tosh, Manu Dibango, Toots & The Maytals, Dennis Brown and the 2-Tone bands - Specials, Selecter, Madness, etc. Next came the New Wave of British Heavy Metal scene, spearheaded by Diamond Head and Iron Maiden together with the New Romantics and bands like Duran Duran, Culture Club, Spandau Ballet, The Thompson Twins, etc. It was an exciting time and George was soon very busy shooting these bands and others for magazine and record company clients in the UK, Europe and Japan. During rock and metal’s halcyon days of the late 1980’s, George was one of the early contributors to Kerrang! magazine and worked for all the major publications of those genres in the UK, Europe, USA, and Australia. Also during this time, George toured the world extensively as the official tour photographer for many of the biggest bands of that era - Guns n' Roses, Aerosmith, Iron Maiden, Bon Jovi, Skid Row, Motorhead, Anthrax – while at the same time working exclusively with Terence Trent D'Arby and a young Whitney Houston whenever she toured the UK. By 1990, George's reputation and profile were so high that he landed the prime job for any music photographer; i.e., official tour photographer with the Rolling Stones on their Urban Jungle Tour of Europe. Then, early in 1991, Axl Rose invited George to join Guns n' Roses in Rio de Janeiro to photograph them exclusively at the Rock in Rio II festival at the Marcana Stadium, following that with the Get In The Ring Tour of the USA in 1991 and the Use Your Illusion world tour through to 1994. Next followed a stint with Aerosmith in 1994 -1995 for the Get A Grip world tour and again in 1997 for the Nine Lives tour of Europe. At the end of 1997, for personal reasons, George took a break from touring and worked in the studio doing editorial and record company sessions shooting bands as diverse as Blur and Iron Maiden. In 2000, after a three year hiatus of no overseas tours, George went to Rio de Janeiro to hook up with Guns n' Roses again at Rock in Rio III where the new GnR were headlining to 250,000 people (also photographing the entire set of Oasis). In 2002, Axl again invited George to go to the Far East for a short tour followed by the aborted autumn tour of the USA (which ended in a riot in Philadelphia!). After that, George settled down in the U.K. with his young family, preferring to work with bands touring the UK/Europe and those based in the UK. The list, by no means complete, of acts he worked with includes Ashanti, Beyonce, Black Sabbath (reunited), Cream (reunited), Eric Clapton, Annie Lennox, Cher, Coldplay, Deep Purple, Depeche Mode, H.I.M., Jay-Z, Joss Stone, Judas Priest, Madonna, Metallica, Morrissey, New York Dolls, Oasis, Paul McCartney, Pink, Primal Scream, Queen + Paul Rodgers, REM, Rolling Stones, Scissor Sisters, Shakira, Simple Plan, Soulfly, and Sting. In 2006, Axl Rose once again invited George to New York for three warm-up shows, followed by dates in Europe and the UK. George continues today to work for bands, record companies, and editorial clients using the latest digital cameras and imaging technology meeting today's demands for instant delivery. He specializes in providing the photographic requirements that today's artist and artist brands now demand for a variety of uses (including merchandising of all kinds), as well as web and print use for press, promotion and advertising. According to George, "these days, anyone can call themselves a photographer because they have a digital camera and, while shooting a lot of pictures, they get at least one or two good shots. My trademarks are creativity and imagination coupled with professionalism and over 25 years experience of shooting under any lighting conditions at the drop of a hat. Quality before quantity is what I am about." #2 - Blackmore's Night - Lumley Castle, Newcastle-upon-Tyne, UK - 07 May 2001 Ritchie Blackmore and Candice Night photographed exclusively for the cover of the CD album "Fires at Midnight" at Lumley Castle, Newcastle-on-Tyne, UK - 07 May 2001. All images Copyright 2001 & 2007 George Chin - www.georgechin.com - All rights reserved. Except as noted, All other text Copyright 2007 - Mike Goldstein & RockPoP Gallery (www.rockpopgallery.com) - All rights reserved. Appreciating the time and energy you put into your blog and in depth information you offer. It's awesome to come across a blog every once in a while that isn't the same old rehashed material. Excellent read! I've bookmarked your site and I'm including your RSS feeds to my Google account.